At a pre-meeting of CGIAR participants for the Share Fair starting tomorrow, it was exciting to learn about the diversity of the CGIAR presence at the Fair. The participants are diverse in where they come from too both by birth and location including Syria, Mexico, Malaysia, Colombia, Rome, Philippines, Benin and more. The CGIAR participants are also presenting a wide range of interesting and exciting activities, projects and approaches based on knowledge sharing of various types–which we will try to share with you over the course of the Share Fair…so stay tuned. Rome-based international agencies are jointly organizing a 3-day Knowledge Share Fair to showcase success stories and learn from each others good practices and experience. The open-house event will provide an extensive insight into the agencies’ many efforts and related activities in the field of agricultural development and food security. The Fair will be a platform for people from different agencies to informally and openly discuss their personal experiences and lessons learned, to build networks and to share knowledge and information using modern web-based communication tools. It is the first time that an event of this nature has been organized by the participating agencies. The Fair is jointly organised by Bioversity International, the Consultative Group on International Agricultural Research (CGIAR), the UN Food and Agriculture Organization (FAO), the International Fund for Agricultural Development (IFAD) and the World Food Programme (WFP). Video-feeds and blogging will make it possible to follow and participate in the event online. Watch this blog for interesting and informative posts on the event. After more than one year since the Inception workshop for the ICT-KM Knowledge Sharing Project, many of the 6 KSinR Pilot Projects have carried out and completed their activities and piloting periods within the KSinR project. On Monday 17th November 2008 a Synthesis workshop for the Knowledeg Sharing in Research Project will take place. The aim of the workshop is to bring all the Pilot Projects together to discuss their activities and capture lessons from their piloting activities. We look forward to some fruitful discussions and exercises and being able to share more information derived from the project through this space and others. “Maximising the impact of Agricultural research in Africa: A workshop on research communication” starts today-Watch this space. 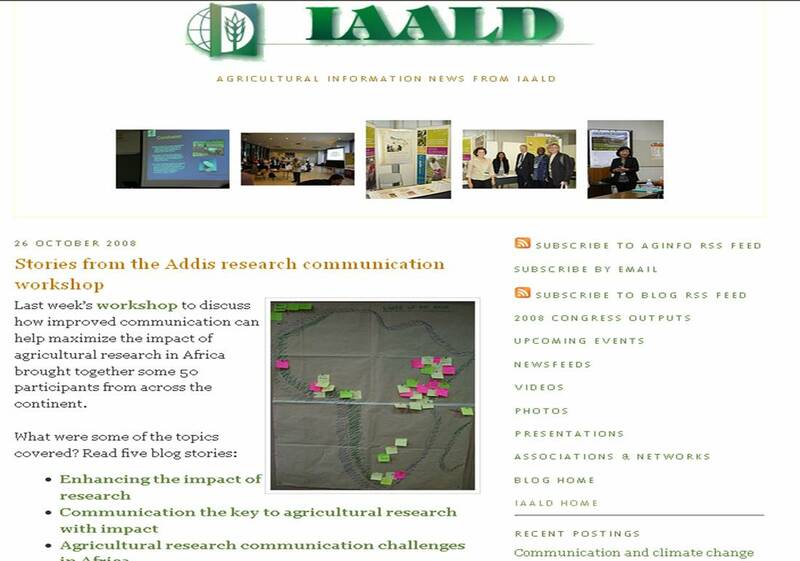 As part of learning about and trying new tools and approaches to communication, as well as wanting to share with others out there about the workshop- some of the organisers and participants will be blogging on the event- “Maximising Impact of Agricultural Research In Africa: A Workshop on Research Communication” which starts today- October 21st- at UN ECA in Addis Ababa, Ethiopia. The workshop is being organised by IFPRI, WBI, GDN and ICT-KM. Check out this space for more posts on the event.